To Be or Not to Be There is not even a question, as going to Shakespeare on the Plaza is your chance to see the Bard's plays in the open, much as they were in his day. 2016 marks the third year the event will take place, and again will feature two well-known plays that will come to a wide audience in the open air. The Vortex Theater and the City of Albuquerque have partnered to bring together the 2018 season, which features the plays of Much Ado About Nothing and The Tempest. Sixteen nights of outdoor Shakespeare bring together some of the city's best actors for classic comedy and intrigue. Performances begin at 7:30 p.m. on Thursday through Sunday nights for four weeks, June 8 through July 1. Unlike some of the live shows held in the Civic Plaza, there is seating provided when you see the plays. Just like a real theater, there will also be concessions and pre-show entertainment. The theater has theatrical lighting and sound. The plays run roughly two hours and the actors are fully costumed. The plaza is ADA accessible. All shows are at 7:30 p.m. Though the plays take place in summer, the evenings can sometimes be cool, so bring a sweater just in case. Prior to the show, there will be entertainment such as magic and teenage Shakespeareans. Get there early to enjoy the pre-show and the concessions. If a show is canceled because of the weather, patrons will get a voucher that will be good for a later performance of Shakespeare on the Plaza or for a performance at the Vortex Theater during the current season. 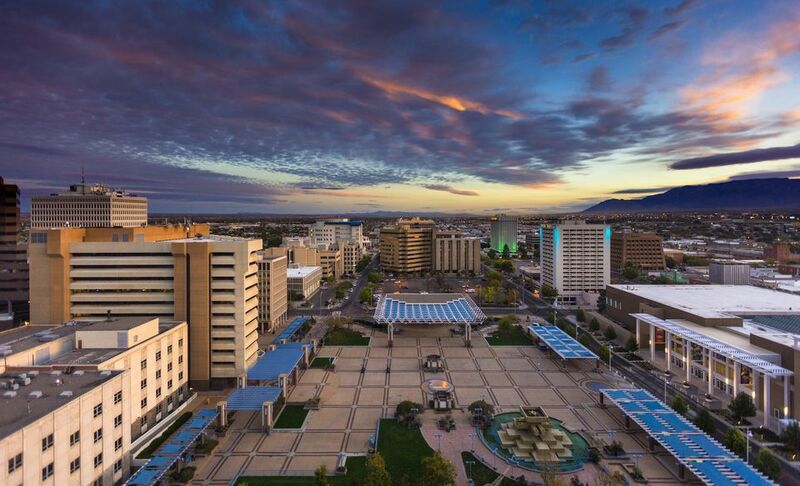 The Civic Plaza is located at 5th and Marquette in downtown Albuquerque, between City Hall and the Convention Center. Find the theater on the north side of the plaza, off Marquette, under the overhead awning. The Martin Luther King exit off I-25 becomes Marquette downtown and leads directly to the plaza. Admission for 2018 for all shows is FREE. Because it will be free, expect greater crowds. When you show up at the theater before the show, you will be given a number. While you wait for the show to begin, wander Civic Plaza, where there will be food, food trucks, and pre-show entertainment. On Fridays and Saturdays, there will be a bar. Then listen for your group and number to be called. When you hear your number, take your seat. Paid parking is available in the garage located beneath the plaza. It is accessed by going west on Roma or east on Marquette. There is also free street parking in the surrounding neighborhood, a paid lot east of the Galeria Plaza, and the Convention Center paid garage. Shakespeare on the Plaza began in 2014 as a collaboration between the City of Albuquerque and the Vortex Theatre. The Vortex had run a Shakespeare-inspired "Will Power" festival in the summers from 2010-2013. The three-play, nine-week summer festival took place at the Vortex. Collaborating with the city allowed the theater to take the plays outdoors, a tradition of summer festivals worldwide. The first year, A Midsummer NIght's Dream and Romeo and Juliet were performed. In 2015, Julius Caesar and The Taming of the Shrew were performed. Both years, the plays were performed for 16 shows over a period of four weeks. Visit EDo or the east downtown district. Learn the history of nearby Route 66 and where it thrived in Albuquerque. Find out more about Shakespeare on the Plaza. 12 Tips For Getting Free Tickets to Shakespeare in the Park!